Our Gates Make An Entrance! Tedford Overhead Doors and Gates is a full-service provider of residential and commercial gates. We offer a huge selection of standard and semi-custom models, sure to fit your needs and your budget. As beautiful as they are secure, our gates are a perfect way to add architectural interest and distinction to your property. 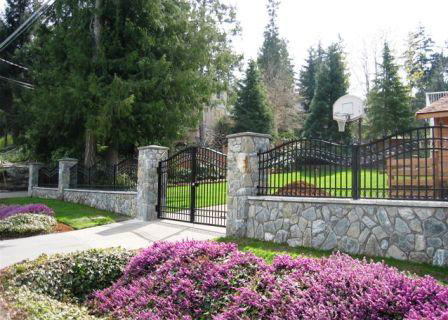 Custom Designed Aluminum Estate Gates offer security, privacy and peace of mind. With more than 20 standard designs, it's easy to choose a gate that reflects your taste and style. You also have the option of working with one of our designers to make the gate of your dreams come to life. The end result is sure to complement the beauty of your home. Handcrafted Wooden Estate Gates are master crafted in western red cedar or fir, emanating a welcoming warmth to your home. Choose one of our semi-custom wood gate designs or work with our designers to make your ideal a reality. All of our aluminum and wood gates are designed, fabricated and finished to withstand the elements, from heat and high humidity to snow and ice. We use only premium materials to ensure long-lasting beauty and performance. The addition of matching fence panels, garden or pedestrian gates will further complement your driveway gate. Please visit our contact page for additional information.